After some consideration, you've decided to sell your Havasu home now. Demand is up. Buyers want to take advantage of interest rates before they start to rise. 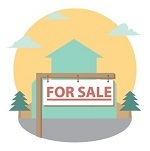 Now's a great time to put your home on the market. Before you do, you might need to perform a few maintenance tasks. 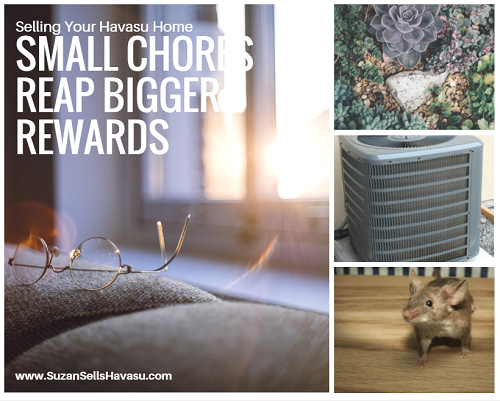 Small chores reap bigger rewards when selling your Havasu home. When selling your Havasu home, you need to make sure it is ready to show at all times...even if you've already moved out of it. If you've left the city, consider hiring a pro to keep it show ready. Your Lake Havasu REALTOR@ might be able to recommend someone. Still in the city? Drop by regularly to clean up your property. These are the areas that need the most attention. One great thing about living in Lake Havasu City is that landscaping tends to be pretty minimal. After all, rocks don't need mowing. However, you still need to keep your other vegetation cleaned up and clear of any weeds. Sweep walkways and driveways. Trim back any shrubbery if it starts to grow over walkways. You want all pathways to your front door clear for visitors to the property. When selling your Havasu home, you want to make sure all of your interior systems run properly. This includes the HVAC system. Now's a good time to service your heater. In the spring, change out your air conditioner filters. Since we run our AC units continually throughout the summer, you might want to change them once every six weeks. This ensures that the system runs efficiently and that any buyers looking at your home stay comfortable even during the hottest times of the year. One thing about living in the desert is that dust builds up quickly. Partner that with high winds and windows become filthy quickly. Clean these at least once a week and when you know someone will be by to see the house. Dirty windows leave a bad impression on buyers. Finally, when selling your Havasu home, keep pests out. Mice, scorpions, birds, and even snakes might try to find a place to nest inside your home. Scan the exterior for places of entry for these pests. Then, plug up any holes that might be entry points to keep them out. Fine wire mesh can be installed over ventilation shafts. These allow the vents to continue to let air escape but still keep pests out.